It’s not a matter of if you will move your storage to the cloud. It’s a matter of how and when. Gartner predicts 50% of enterprises will be using a hybrid cloud by 2017. If you want to learn how to build a hybrid cloud with AWS, but are having trouble getting started, attend our webinar and learn how to build your own hybrid cloud with AWS, SoftNAS and existing equipment. 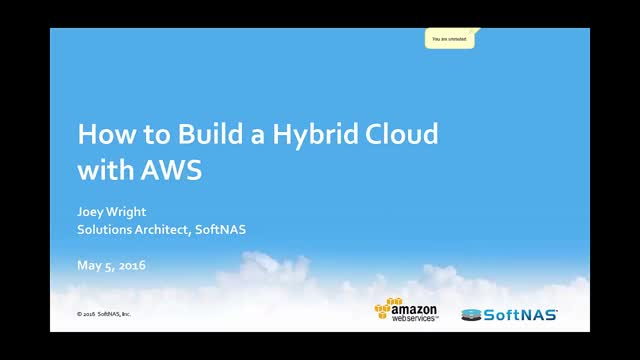 -Best Practices for Building A Hybrid Cloud: Tips and tricks from the SoftNAS team on how to get your hybrid cloud up and running in 30 minutes. Gartner predicts hybrid clouds will be the most common cloud architecture by 2020. With AWS and VMware vSphere, companies have the ability to create a hybrid cloud architecture with ease. But what is the optimal storage architecture for a hybrid cloud? What’s the best way to build it? How do you guarantee your data will be highly-available and protected? Your on-premises storage maintenance bill is due. It's hundreds of thousands or millions of dollars, and you know you will always need to purchase more storage capacity. -Do you pay your maintenance bill and commit to another 3-5 years? -Do you move to a hyperconverged architecture? -Do you migrate to Microsoft Azure cloud storage? Many enterprises have recognized the need for cloud information protection. Amazon Web Services (AWS) together with SoftNAS protect your business-critical data in the cloud, to ensure your business and applications are safe from downtime and data loss. In this webinar SoftNAS and AWS discuss the 4 best practices for protecting your enterprise data in the cloud. Thinking of moving your infrastructure to the AWS cloud? What is the best way to migrate the data and apps? How do you minimize risks and maximize benefits? How do you ensure IO-intensive and latency-sensitive applications perform optimally? You want to move your data to the cloud but need to make sure it’s protected. Malware, bots, human error, natural disasters and other challenges can result in downtime, costing your organization thousands of dollars in lost revenue. Joey Wright, Solutions Architect, SoftNAS Inc.
Gartner states that by 2020, 30% of organizations will leverage backup for more than just operational recovery (disaster recovery, test/development, DevOps, etc.). Business continuity plans are a must in today’s environment, where even a few minutes of downtime result in lost revenue. Data backup procedures are a critical part of these business continuity plans. But as the menu of backup options increases with the introduction of new technology, it can be difficult to choose which backup method is best for your business. -Replacing tape backups: Disk or Cloud? This live event will be held on Tuesday, November 8, at 1:00 pm ET/10:00 am PT. Register today! Persistent storage is critical when running applications across Docker containers on AWS. In this webinar, hear best practices to spin-up, spin-down and move containerized applications across AWS environments whether running Docker or Amazon EC2 Container Services. Amazon Virtual Private Cloud (VPC) enables you to launch Amazon Web Services (AWS) resources, like EC2 instances, into a virtual network that you’ve defined. They are flexible, secure and a core building block of AWS deployments. Eric has configured over 1,000 Amazon VPC configurations, ranging from simple to complex implementations for Fortune 100 companies. - How do packets really flow in a VPC? - To NAT or not? - VPNs and VPCs: a good thing? You won’t find these lessons anywhere else! 80% of enterprises are now adopting DevOps, and 27% are using Docker. Running your Docker apps on Amazon Web Services (AWS) is a match made in heaven for DevOps. But what is the best way to provide persistent storage across Docker containers, EC2 instances, S3/EBS storage or AWS regions? -Do you pay your maintenance and commit to another 3-5 years? -Do you upgrade your data center architecture? -Do you shift to the public AWS cloud? SoftNAS®, Inc. is the leading provider of software-defined NAS solutions, protecting mission-critical data for customers using any combination of public, private and hybrid clouds. SoftNAS gives its customers the enterprise-class data security, protection and performance required to safely, predictably and reliably operate IT systems and applications. SoftNAS believes in powerful, hassle-free data management and works with any hardware, any data type, across any geography, and with any IT environment, including the most popular public, private, and hybrid cloud computing platforms: Amazon Web Services™, Microsoft® Azure™, CenturyLink Cloud® and VMware vSphere®.